Matt Sanchez Archives - Joe.My.God. Some of you have probably seen last’s night MSNBC Countdown, where the Sanchez story was #1. 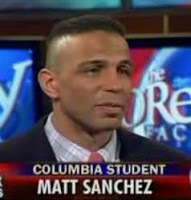 Today Matt Sanchez has posted a letter on Salon..
[Image removed at request of photographer.] From an anonymous emailer: Matt Sanchez meeting with possible 2008 presidential candidate Newt Gingrich. No further details available.